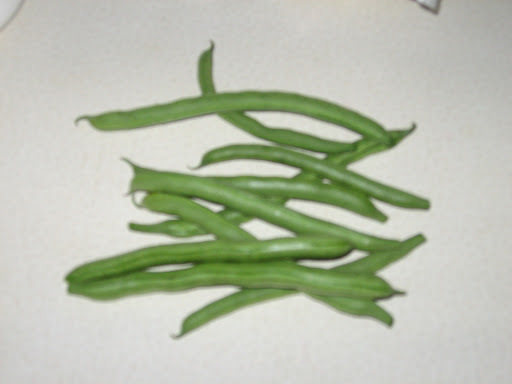 I’m going to have more canned green beans this year than I care for. So, I need your recipes. The only way I really like green beans is the green bean casserole. But I would like to expand my recipe book for green beans. NO PORK PLEASE These are the pole snap bean variety (NOT the kind that you cook all day that are flat with bumps). These are the skinny round ones without bumps. I have the settings so that you can post anonymously, so please-Give me your recipes! Living where we do, it can become quite difficult to get out and get entertained. With no babysitting options, it’s even more complex, but creativity usually wins in the end. The most recent night of enjoyment was the time the Japanese beetle flew down my brassiere. We go to a lot of shows at the farm I worked at in college in Cookeville. The rodeo was one. There is also a competition we watch at times called the TN Cowboy Mounted Shooters. They ride on horseback and shoot blanks at balloons. The video is below. Sounds silly, but I assure you it requires a steady horse, excellent marksmanship, and good riding skills. Many contestants view it as a show, like a cowboy renfest. They show in complete period costume and really get into it. Each contestant has two guns in a holster around their waist. Each gun has the exact same amount of bullets as all the other contestants-there is no going back to catch the ones you missed! They must go a certain route. Five second penalties are added for each missed balloon, and each overturned barrel. The blanks allow the balloon to pop and not hurt the audience. I was impressed with their ingenuity. The first girl was the fastest for then. She was later beaten by a few people. A really astonishing one rode, naturally, as we were facing the doors leaving. I kept the second one just to show a difference. After each contestant, all the kids run out and change the balloons for the next one. This particular one had CMT filming for something. They asked us to sit a certain place to get shot with the camera, but with Arlis’s eye sight, and dad being there, we opted to stay where we were and be off camera. If you see this on CMT-remember we were there! I read where someone actually lost their faith in God because their father died at age 59, and they thought that was too young…. There was once a man, let’s say at age 59, that actually died of a heart attack. A heart attack being a much faster and better way to go than many. He was brought back via the paddles and everyone shouted, “Praise God!” Twenty years later, he died a very long and lingering death in a nursing home. How to get rid of Japanese Beetles. Unless you have Japanese Beetles, you’re not going to care that your neighbor’s lawn, or the farmers’ crops are completely devastated. The last thing anyone is going to do is go to the trouble of pest control for someone else. But, if you’re reading this, you probably wish they would. Everyone says the traps don’t work. Well, here are the facts. You decide for yourself. The traps are designed to only catch the males. Therefore, to actually lessen the population, you will have to use more than just the traps. One things we do is spray plants that are decorative, or not consumed any more (but not flowering plants, please). For example, that leftover lettuce or cabbage stump that they’re eating. Another way we do it is to hand pick them. 1-EVERY DAY I go out in the morning AND in the evening and hand pick every last little bugger off the beans and corn. They love the beans, and the little hairs that grow out of corn ears. I also check the apple tree, cherry tree, raspberries, and a few areas that are prone. 2-It doesn’t matter if they are on a weed or something that matters. Get everyone you can. If you don’t that’s just more for next year. They are most active in the heat and dry of the day. They will readily fall off the plants with the slightest breath in the mornings and evenings. I always do at least two passes because many of them will fly back up to the plant if you miss them. 3-Set up LOTS of traps. Now, if you are on a little lot, you will probably set up 5 or so. We set up quite a bit, but we have about an acre just in garden space. We put them about 20 feet from the garden, close enough to lure them away, but far enough to lure them away. 4-EVERY DAY I go out and empty the bags. I don’t replace the bags, I just hang them back up until they wear out. I’ve had bags last for weeks. I empty them all into a gallon glass pickle jar with plain water in it and close the lid. Here is why the traps don’t work for most people. Dead beetles are about the foulest smell there is, and I shovel chicken poo. They are driven away by the smell of the dead and drawn to the scent of the bait. So the traps will lure them in, but only close enough to be a nuisance and not get trapped. Therefore, you will have to empty them out often enough to prevent the bad smell. 5-Dispose of your beetles in several ways. Put a lid on them and let them roast in the sun and drown. Use soap in the water to make them drown faster. We feed ours to the chickens and ducks, so we don’t use soap. I just call the birds and dump them on the ground. They fight over them. It saves on feed and helps the atmosphere. Dead beetles really smell BAD!!! Now, the hardest part of all is convincing your neighbors to do the same. If you’re lucky, you’ll convince them to let you buy them the traps and empty them every day for them. But I doubt it. I have neighbors that lose their entire vineyard every year, and they won’t do anything about them. We have used this method for two years, and have noticed a reduction in the number of beetles from last year. You can also buy and use Milky Spore, but is so expensive, and takes so long to actually affect anything, that you will have to do something in the meantime. I hope this helps you. I was originally going to write this about the new kitten we got. See “Knight” looks exactly like Toothless, even acts like him, but Marcus insists we stick with Knight. He is solid black save about 15 white or grey hairs under his chin that you really have to look for to see. He was perfectly fine the night we got him, but the next day, his eye started getting gooey. The next day it was obviously gooey, and he felt like he had a fever. The next day he was lethargic and would not open his eye. The vet gave us some meds, and believe it or not, the eye dropper of Amoxicillin is far harder to get down him than the antibiotic ointment going into his painful eye. Yeah, mornings are a real blast now. SO…anyway…he must be feeling much better as last night I woke up screaming for Arlis to help me. The kitten had embedded itself in my hair and was eating my brains, at least that’s what it felt like. It was difficult to remove, especially for a sleep deprived husband. We had already been awoken to computer wires being played with and a kitten climbing my husband’s clothes in the closet only to get stuck at the top of the hangers and mew until someone got him down. The next occurrence was when Arlis woke up with a yell. He raised his left arm only to find a kitten with all four sets of claws fully embedded and wrapped around his tricep. His skin was being pulled away from his body by little pointy kitten teeth. Now, the reason I’m writing today is b/c we decided to eat some of Buck’s chops. Buck was probably around 8 years old. In fact, he was turning grey just in the last month. Most people just sell them for dog food at this time, but we wanted to try it. We have a meat grinder, so we kept some of the cuts whole, like chops and shoulders and such. We sold the lamb, assuming it would be much better, at $2/pound live weight. We got less than 40% return. Buck never sold, and he got 49% return, or something like that. That’s REALLY good. Holstein (dairy)- expect a 30% return of the hoof weight. Some people will try to tell you more like 60% or 70%. They are more than likely talking dressage weight or hanging weight. Hanging weight is where they remove the hoof, head, entrails, and skin, and hang it. Of course you’re going to get a larger return from hanging than hoof. Don’t let the seller fool you. Presley was a Holstein, and although better than store bought-rocks are better than store bought-he was tough and grisly and pitiful looking. Shaun was a haired sheep, not a wool sheep. He was confined and grain fed b4 we bought him. He was extremely tender, but also full of so much fat you threw away half of what you got. Buck was pasture raised and fed and old. He weighed in at 162 pounds. We had Buck chops tonight seasoned very lightly with rosemary and salt and fried without oil. It was some of the best meat I’ve ever had. It was also very tender. In fact, he looks better than that lamb we sold. Shear happiness was on us all!! Things are starting to look up now. We are starting to sell things, and starting to almost break even on a few things. Our goal is to make a profit of at least $1000 this year or the next and apply for farm tax. That looks possible now and I, for one, am very excited about it!